Today I know that I have made at least two people smile… that’s something I would like to achieve every day. First, I finally completed a pair of socks for Mr Snail from yarn that I bought at Wonderwool. These socks are very unusual for me, in that I wasn’t able to make the colours in them match up exactly, because there is no regular repeat in the dying of the yarn. I am usually very careful to get an exact pair, but that is not supposed to happen with this wool, Anyway, Mr Snail certainly smiled when he was presented with them, despite the fact that it’s too warm to wear the things at the moment. Second, I received an e-mail to let me know that a little parcel I sent on Wednesday had arrived safely and was found by the recipient in her woodpile, where the postman had carefully hidden it out of the weather. This particular parcel was sent to a blogging friend who is having a hard time at the moment and needed cheering up. 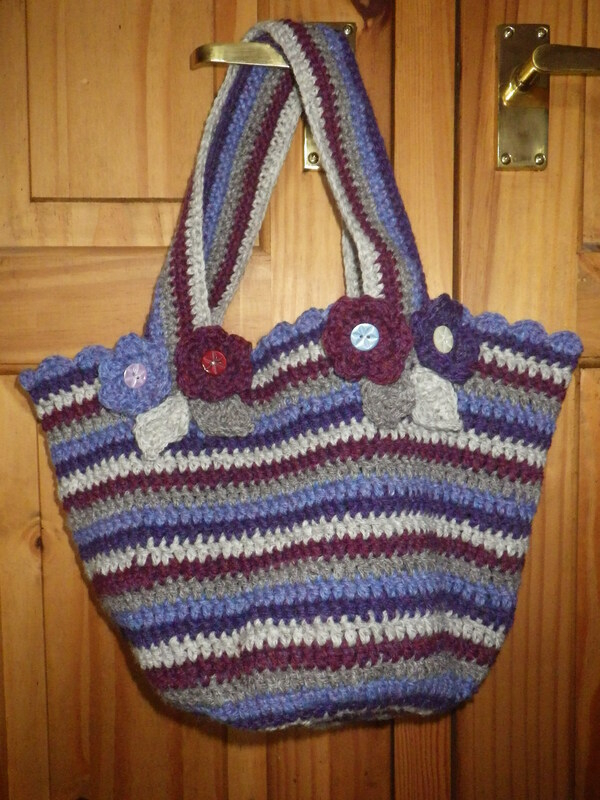 Despite only having met over the internet, I had a real desire to make her smile and so I got out my crochet hook and yarn and made her a jolly chunky bag, just slightly smaller than the one I made for myself as a project bag the week before. They say that when life gives someone lemons, you should pour them a gin and tonic (or something to that effect), but it’s much easier to post a piece of crochet than a gin and tonic! Anyway, her delight at receiving the parcel also made me smile, so we are clearly recycling happiness here – what a great way to end the week! Then this yarn would be perfect for you! Thank you – and so easy too! I am not one to try to match socks. 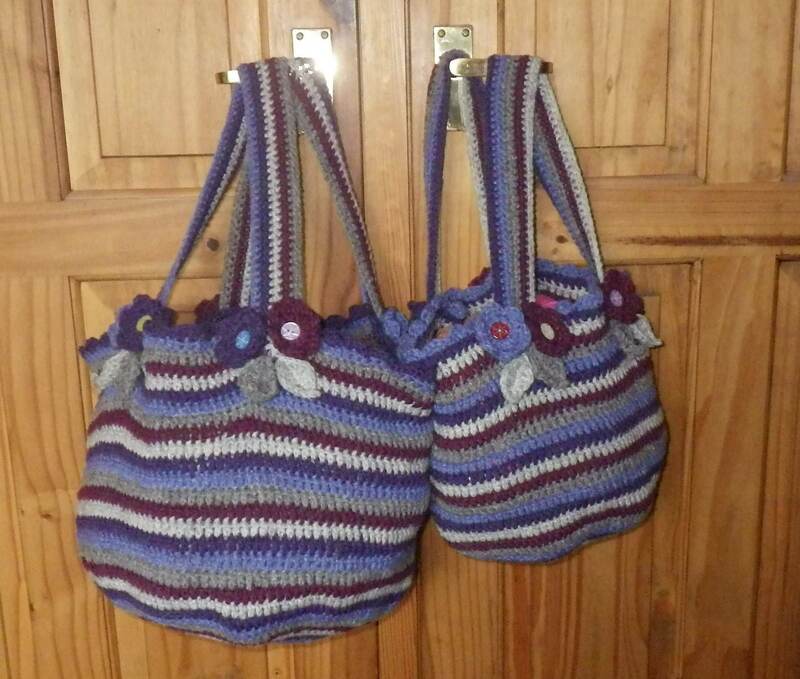 Several times, I started with one pattern, decided I didn’t want to make it again, then made the second using a different pattern. When making two color socks, I like to switch colors. 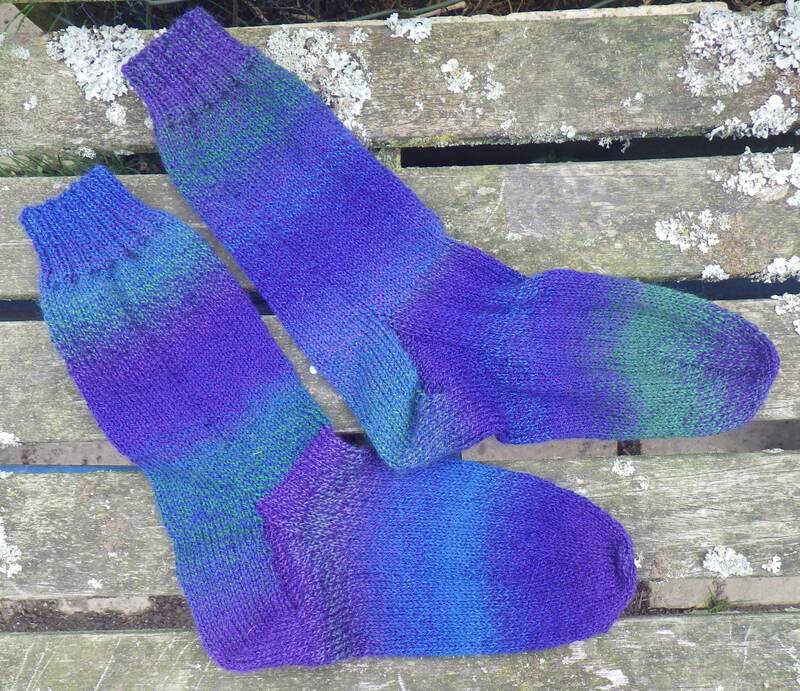 Noro sock yarns are great for socks. You can make them exactly the same and they still look different. I guess life is much easier if you deliberately try to make them different! I reckon I’m at least the fifth you’ve succeeded with today. Excellent… Let’s keep them coming! Those socks certainly make me smile, so I can imagine Mr Snail being quite pleased with them. I love the bright colours AND that they don’t match up. I also love that you do things to just make other people smile. It’s a beautiful thing. I building up the smile-count! Looking forward to seeing the bag… I’ll be round as soon as I can, but probably not until the week after next as I’m going away this coming week. It’s the yarn that makes them… the pattern is about the most simple one for socks that it’s possible to find… just want the yarn to shine through without the distraction of fancy patterns. It certainly does shine. That’s a brilliant colour, in all senses of the word, and I love them! I love that bag – no wonder the recipient was pleased. What a lovely surprise to come home to. Those socks would be like wearing the aurora borealis on your feet! I’d grin, too.